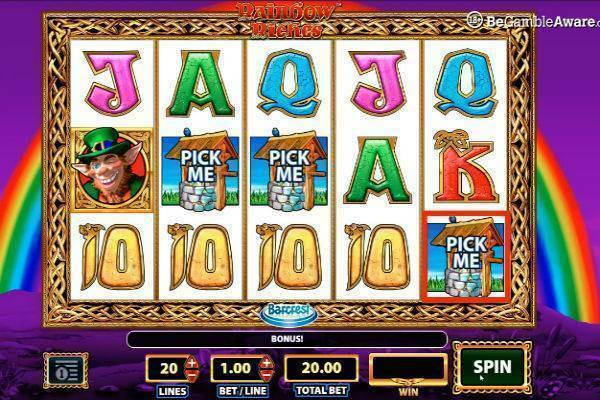 The charm of Irish luck is always a favourite, and Rainbow Riches is one of the most popular slots in this category. 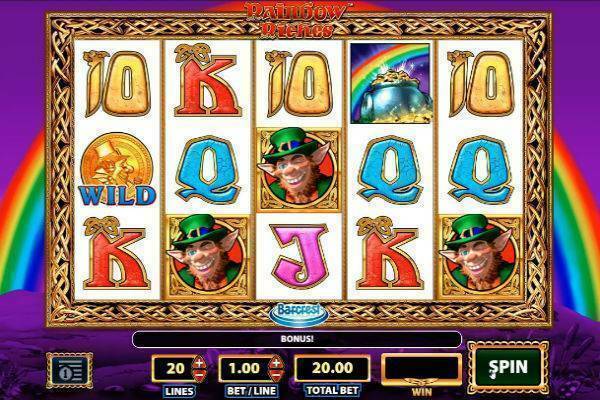 Rainbow Riches is a 5 reel 20 payline game from Barcrest, with leprechauns, wishing wells. Although the base game does look a little dated compared to other video slots out there, the 3 bonus rounds are magical games that take you through the enchanted countryside, filled with multipliers and other goodies. This is a very popular slot in the UK, and you might even have come across it in your local bingo hall. Now you can play Rainbow from the comfort of your home at these recommended casinos. Rainbow Riches is a pretty easy game to play. Start by setting the number of lines you want to bet on, which can be just 1, or all 20 of them. We suggest betting on more lines to increase your chances of winning. Then set your bet per line, which ranges from £0.01 to a hefty £25. This makes the minimum bet per spin at just £0.01. Rainbow Riches has a fixed jackpot of 500x your bet, which can be won by spinning 5 Wilds. That means if you’re playing at just £0.05 per line, you can get £25 into your pocket. Now we know all some of you might be thinking this isn’t much, but anyone who’s played this game will know the secret is all about the huge multipliers in the bonus game, the best of which can boost your win by 500x. That means with the right combination of luck, you can get £12,500 while playing at just £0.05. Obviously, wins are higher if you have a higher line bet. 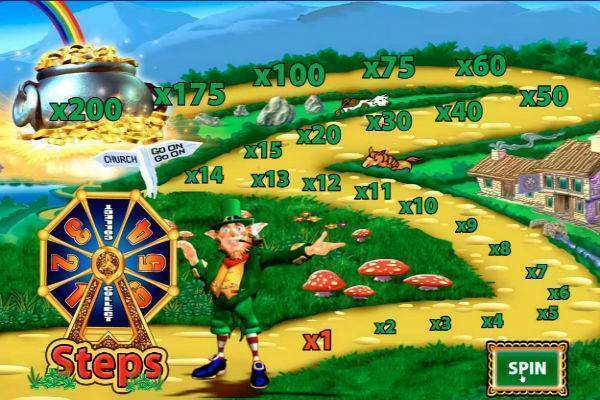 Road to Riches Bonus: Spin 3 or more Leprechaun symbols and you’ll trigger this bonus game. The screen will change completely and you’ll find a path with multipliers on it. When you hit spin, the Leprechaun will give the Wheel of Fortune a spin, which will determine how many steps you can take on the path. Each step will get you a larger multiplier. If you make it all the way to the end, your win will get a 200x multiplier! Wishing Well Bonus: Spin 3 or more Wishing Well symbols and you’ll enter the Wishing Well. This is a relatively simple game with a Pick Me feature, which can uncover multipliers going from 2x to 10x. Pots of Gold Bonus: If you spin 3 or more Pots of Gold symbols on reels 2, 3, and 4, then you’ll be in the Post of Gold bonus game. You’ll be in 7th heaven here, with a wheel full of pots, each with some serious multiplier. Even the “small” multiplier is worth 40x, and the biggest won goes up to 500x. This is obviously a very lucrative bonus feature, and you won’t see it often, but when you do, you’re a definitely a lucky dog. To be honest, the base game in Rainbow Riches is really nothing to write home about. You got some vibrant colours going on and some whooshing and tinkling noises, but the game definitely has an older feeling about it. However, when luck strikes and you enter one of the bonus games, you will break into a whole new magical landscapes. From going across stepping stones, to spinning pots of multipliers in the sky, the bonus games Rainbow Riches are simply wonderful and well worth it! 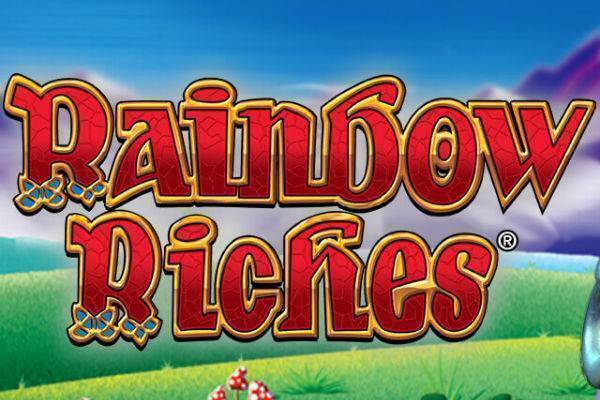 Rainbow Riches is one of the most popular slots in the UK. It has a classic Irish theme, and although the base game isn’t the most exciting thing we’ve seen, the bonus rounds are amazing. Not only are the stepping stones and wheels of fortune games a nice break away from the reels, but they are also full of huge multipliers that can give your win a significant bump up. Try your Irish luck at Rainbow Riches at one of the friendly and trusted casinos recommended on our site!